The underwater images captured by photographer Mark Tipple are so unlike anything you've ever seen, it's easy to mistake them for scenes from another world. They belong to a series known collectively as The Underwater Project, and they are beyond spellbinding. 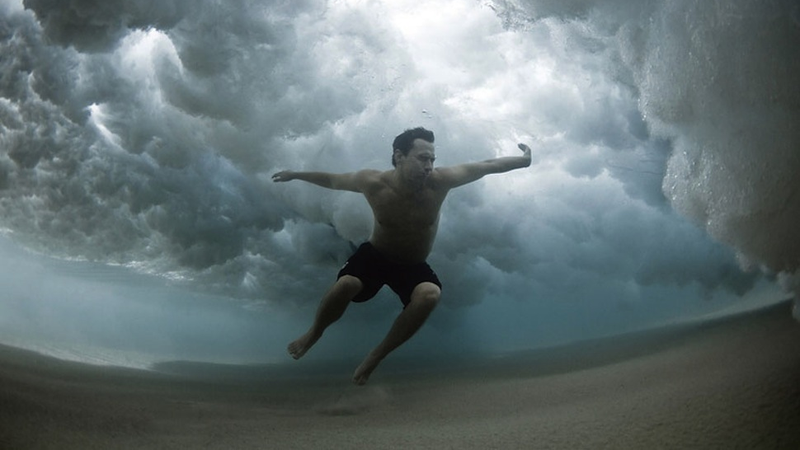 Below the surface, churning waves turn to billowing clouds. To the swimmers recently flung from their surfboards, gravity seems to almost lose meaning. The force of the water is more keenly felt, and becomes a double-edged sword. On one hand, the resistance that it provides as the surfers kick and paddle can help them return to the surface; on the other, a series of unfortunately timed surges can easily prevent them from reaching air, crushing them into the sea floor with mass unfathomable. "Grip the sand, they remind themselves. Go low, stay low. Their faces contort, their muscles tighten in reaction to the struggle for power with the ocean. They surface when the surge has passed. Then breathe." Check out many more photos from Tipple's series, over on his website.